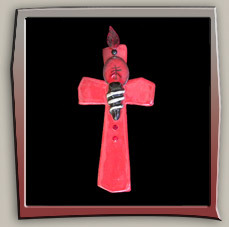 Being a spiritual person myself, I love making crosses, hamsas, anyks and other spiritual-influenced clay pieces like hearts and sentimental wall hangings. 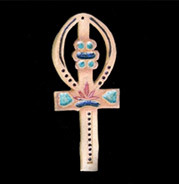 Sacred Ankh in hi-fired stoneware. 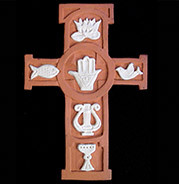 Red cross with Asian design motif. Hi-fired porcelain. 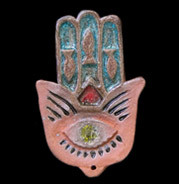 Colorful Hamsa with Mystic Eye. Hi-fired stoneware with melted glass. Make to order. 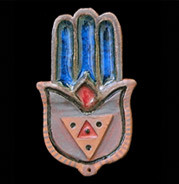 Colorful Hamsa with triangle symbol. Hi-fired stoneware with melted glass. Make to order. 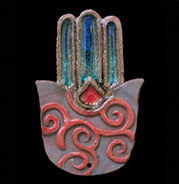 Colorful Hamsa with swirl pattern. Hi-fired stoneware with melted glass. Make to order. 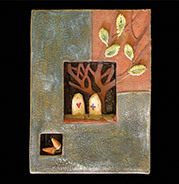 Storybox wall hanging depicting sentimental cemetary scene. Hi-fired stoneware. Make to order. Angel with Dove Triptych. 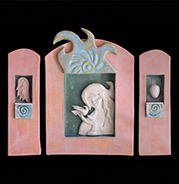 Hi-fired stoneware storybox wall hanging. 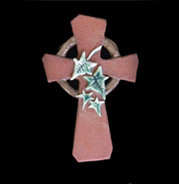 Ecumenical Cross with spiritual symbols. 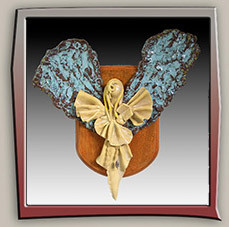 Hi-fired stoneware and porcelain wall art.